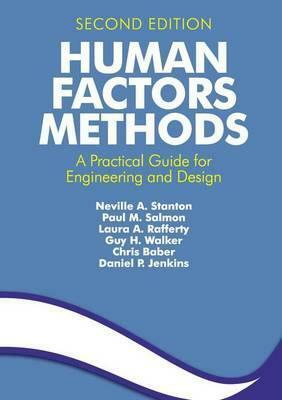 This second edition of Human Factors Methods: A Practical Guide for Engineering and Design now presents 107 design and evaluation methods as well as numerous refinements to those that featured in the original. The book has been carefully designed to act as an ergonomics methods manual, aiding both students and practitioners. The eleven sections represent the different categories of ergonomics methods and techniques that can be used in the evaluation and design process. Offering a 'how-to' text on a substantial range of ergonomics methods that can be used in the design and evaluation of products and systems, it is a comprehensive point of reference for all these methods. An overview of the methods is presented in chapter one, with a methods matrix showing which can be used in conjunction. The following chapters detail the methods showing how to apply them in practice. Flowcharts, procedures and examples cover the requirements of a diverse audience and varied applications of the methods. The final chapter, a new addition, illustrates the EAST method, which integrates several well-known methods into a teamwork analysis approach. Contents: Preface; Introduction to human factors methods; Data collection methods; Task analysis methods; Cognitive task analysis methods; Process charting methods; Human error identification and accident analysis methods; Situation awareness assessment methods; Mental workload assessment methods; Team assessment methods; Interface analysis methods; Design methods; Performance time prediction methods; Human factors methods integration: applications of the event analysis of the systemic teamwork framework; Bibliography and references; Indexes.